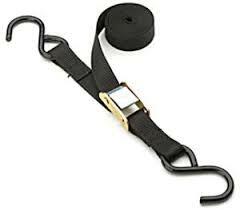 The Safety Strap is 1" X 15', and is used to secure and unload dolly set. Hook one strap in the eyebolt, wrap around load , and place other hook in remaining eyebolt. Pull almost snug. It is best to leave a little slack in strap (one or two inches), release ratchets, and then release cambuckel in short pulses. Included with purchase of dolly set.